Craving a Chinese Take Out inspired dish without a ton of MSG, preservatives, fat, and added sugars? Ally may have found the perfect dish for you! What do you do when the freezer is running low and the pantry needs a restocking? You go with what you have! This month has been incredibly busy with the release of Great American Grilling! Shopping has been one of the things we’ve put off. That left my wife Ally with a pound and a half of lean ground pork and a box of quick Quinoa. When I left the house I knew that somehow those two things would come together. Later that afternoon my phone rang and Ally informed me that we were having Chinese for dinner. When I hung up I wondered if I supposed to stop and pick up Chinese take-out. I called back and confessed that I missed something in the conversation because I was listening to NASCAR and talking on the phone. I was informed that we were still having ground pork and Quinoa. Now I was really confused. What happened to Chinese food? 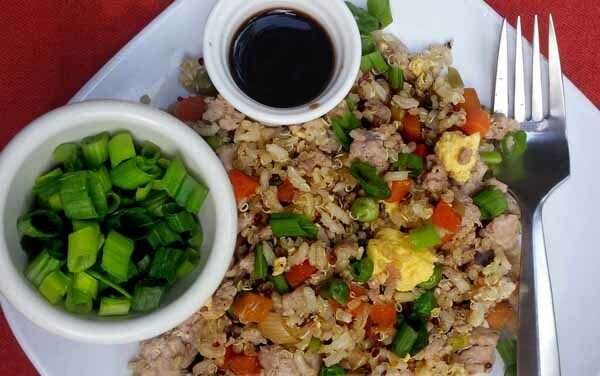 Ally had found a fantastic Pork Quinoa Fried Rice recipe on the website for the National Pork Board – Pork Be inspired! I actually have some history with some of the PR people with the National Pork Board. While I was working on my book Checkered Flag Cooking my friend Anne Rehnstrom, at the Pork Board, allowed me the honor of helping serve up hundreds, and hundreds, and hundreds of Hickory Smoked Pulled Pork sandwiches to teams and crew members in the garage areas of several tracks on race weekend. 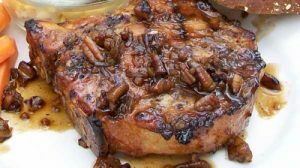 Their website – www.porkbeinspired.com – includes much more than just recipes for pork chops and ribs. 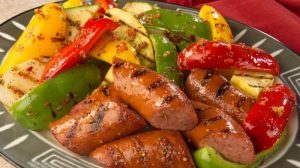 The site has countless recipes for dishes for just about every meal and occasion. There’s something for everyone. That’s how Ally found her inspiration for this flavor packed recipe. She actually typed in a search for “ground pork and quinoa” and up popped an inspireing pork dish! Ally’s Twist on the Original Dish! All did a few things differently than the original called for. For one, she skipped the asparagus spears and increased the amount of peas and carrots. That was because we didn’t have any asparagus but we did have some frozen peas and carrots. Also, in addition to the low sodium soy sauce she added a few additional spices. Going with the low sodium theme she added in dashes of ground ginger powder and Oriental Five Spice Seasoning. Thankfully we also had some green onions in the fridge veggie drawer. Here’s Ally’s version of the dish with the originnal recipe from the National Pork Board below. You’ll probably want to start the quinoa first if you don’t have any of the quick cook variety. Follow the directions on the package. Brown the lean ground pork and pat off, or drain, any grease. I can tell you, there’s not much to worry about with lean ground pork. Season the ground pork with the Oriental Five Spice, ginger, and pepper. Add in the quinoa and keep hot. Start your vegetables while the ground pork is cooking. In a skillet with oil lightly saute the peas and carrots, push to the side and start scrambling the egg subsitute. Or you can use a small skillet for the egg substitute. Combine the peas and carrots with the eggs – broken up – and stir in the chopped green onions saving some for the garnish. Stir in the low sodium soy sauce and sprinkle with additional seasonings if desired. Combine everything, mix well to heat evenly, serve up hot! 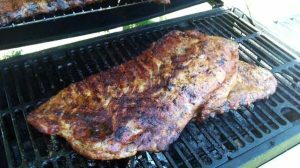 Original Recipe From National Pork Board.